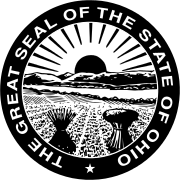 The 1998 Ohio gubernatorial election was held on November 3, 1998. Incumbent Republican Governor of Ohio George Voinovich could not seek a third term as Governor due to term limits, and ran for the United States Senate instead. To replace him, former Attorney General of Ohio Lee Fisher and Ohio Secretary of State Bob Taft won the Democratic and Republican primaries, respectively. Taft and Fisher faced off in a highly competitive general election, and in the end, Taft beat out Fisher by a narrow margin, making this gubernatorial election one of Ohio's closest.